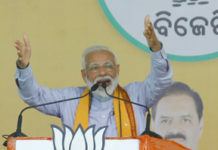 GAYA (Bihar): Indian Prime Minister Narendra Modi on Tuesday said the Congress party hates the labour class and looks down upon those who do menial jobs to sustain their livelihood. 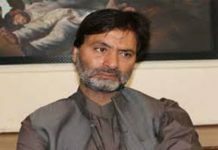 Referring to the Congress party as ‘Mahamilavat,’ he said: “The ‘Mahamilavat’ hates everyone who does his job. They hate ‘Chowkidar’, ‘Chaiwala’, ‘Jhadoowala’, ‘Safaiwala.’ They cannot see a person prospering and progressing in his life by doing his work. This is the only reason why the ‘Chowkidar’ is being abused,” said Prime Minister Modi, while addressing an election rally. 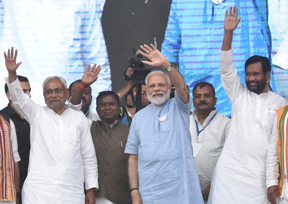 Meanwhile, addressing in Jamui (Bihar), Narendra Modi accused the Congress of “neglecting” architect of Indian Constitution BR Ambedkar and plotting various conspiracies to “defeat” the Dalit icon. “Recall how the Congress treated architect of our Constitution, Dr Babasaheb Ambedkar. How he got neglected? Congress plotted many conspiracies to defeat him. Congress did everything possible to have Babasaheb defeated. It conspired to have his memory erased from the public mind. 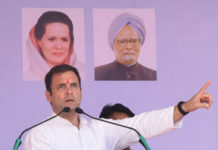 It is important that youth of today knows about these facts,” he said at a public rally here where Lok Janshakti Party (LJP) leader Chirag Paswan, son of party president Ram Vilas Paswan, is in the fray. The Prime Minister claimed that the Congress remembered honouring its own family members, but “forgot” about Ambedkar. It was due to BJP’s efforts that Ambedkar was posthumously awarded the country’s highest civilian award Bharat Ratna, he said.